28 декабря / On 31 December, Tartu welcomes everyone to mark the end of 2018 and the 100th anniversary year of the Republic of Estonia with a pan-Estonian New Year’s Eve celebration 'Full Speed Ahead, Estonia!' on Vabaduse avenue and by the Arch Bridge. A joint dance will take place on the Town Hall Square during the day. On 31 December at 3 p.m., the last joint dance of the Estonia 100’s initiative 'Dancing Estonia' will be performed on town squares across Estonia in honour of the end of the anniversary. Steps will be taught to all participants on town squares at 2 p.m. Everyone is welcome to join in! 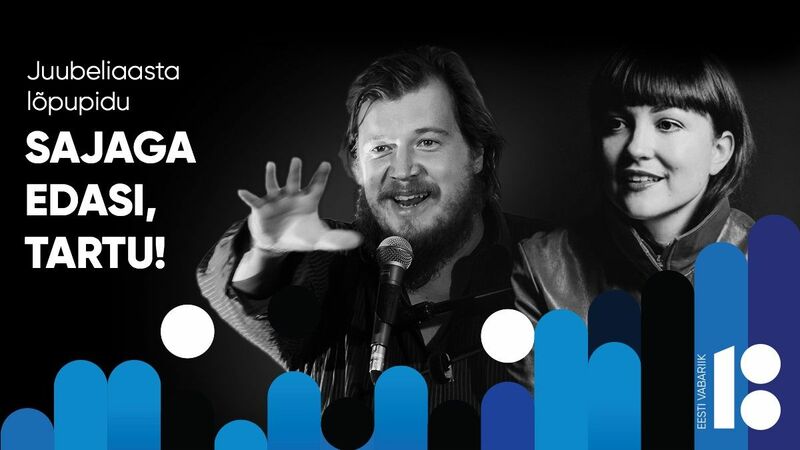 Public concert by Jarek Kasar and Hannaliisa Uusma will take place at 11 p.m. on the Arch Bridge. Before midnight, an address by the Mayor of Tartu Urmas Klaas and a speech by the President of the Republic of Estonia Kersti Kaljulaid can be watched on the screens set up on Vabaduse avenue.